The standard rocambole that we all love. 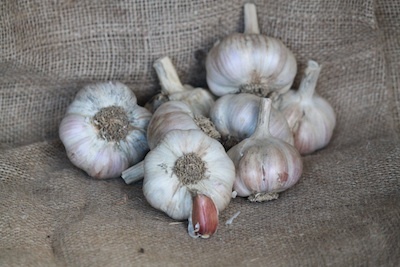 This was one of the first hardnecked varieties to become widely popular. White wrappers with a slight pinkish-red tinge over flattened bulbs. Its eight to fifteen brown-skinned cloves peel easily. You'll love the spicy, rich garlic flavor with a little fire. Loves the cold, northern winters and stores into the spring. Approx. 60-80 cloves per lb. Organic. Fall Ship.